← Choux-laa-laa… A Paris-Brest of sorts. I don’t know about you, but I’m loving Jamie Oliver’s new Comfort Food series. It’s jam packed full of indulgent and hearty recipes that remind me of warm, homely Sunday afternoons spent with family and friends. 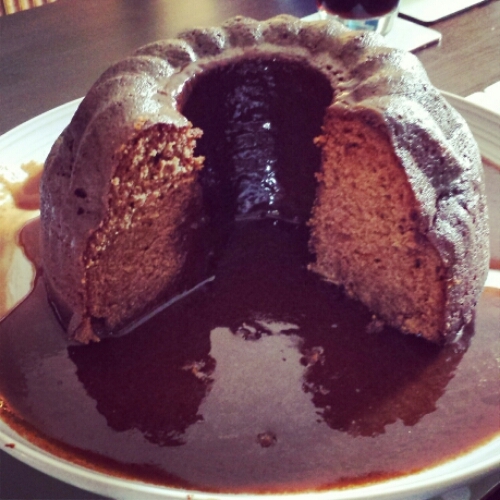 In this week’s episode he showed us how to make an incredibly indulgent Sticky Toffee Pudding. It was delicious! Preheat the oven to 180oC. Steep the tea bags in 300ml boiling water for 3 1/2 minutes. If your dates aren’t pitted, pit them now and put in a food processor with the cinnamon and finely grate in half the nutmeg. Remove the tea bags, and pour the tea over the dates in the processor pressing down to submerge them. Put the lid on and leave for ten minutes before blitzing into a puree. 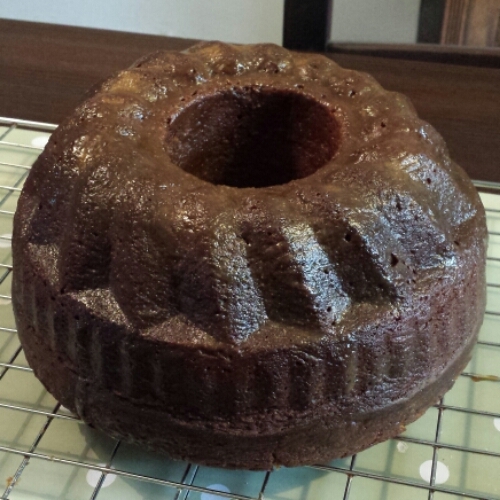 Grease and lightly flour a bundt tin. Cream together the butter and sugars before beating in the eggs one at a time. Stir in the flour and fold in the pureed dates. Pour the mixture into the tin and bake for about 45 mins until a skewer comes out clean. For the sauce melt the butter and sugars together before adding in the rum if you’re using it, and the double cream. Bring to the boil and simmer until it’s a lovely dark brown colour. Turn out the pudding into a warm plate, with a lip, and pour the caramel into the hole and over the top of the pudding. Slice and serve with extra sauce and custard. 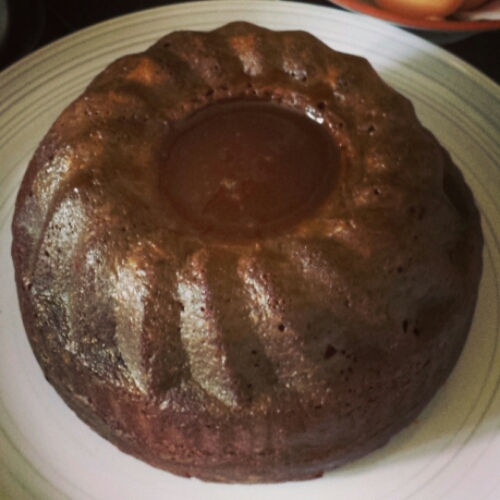 Pour the sauce into the middle of the pudding if you used a bundt tin. MMMMMM…makes me smack my apple-pie-n-ice-cream-covered lips (just finished dinner). I could probably eat a piece of this right now too, no matter how much dinner I just finished! It was so good! You’ll have to try it and let me know what you think. The recipe isn’t there anymore. 😦 Can you post it up? I’ve been searching everywhere for it! Hi Jess, thanks for letting me know about the link. It appears the recipe has been taken down, possibly because there’s a book accompanying the series? I too have had a look on the Internet for it, but with no avail, so I’ll remove the link until I find it again or get a copy of the book so I can type it out. Sorry to disappoint, Hannah. Oooo I’m so excited to try it out! Thank you! I’d just leave the alcohol out. It makes little difference I find.